In this work, we spectrally characterize a Type-I sumfrequency generation in Titanium-indiffused waveguides in periodically poled Lithium Niobate (Ti:ppLN). We discuss features of the phase matching curve that indicate the optimal experimental conditions to run the process with single photons from a parametric down conversion (PDC) source at roughly 1536 nm. With the pump wavelength at 874 nm the idler appears at 557 nm in the green. 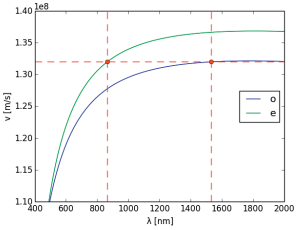 We present spectral properties of the idler at the single photon level. In recent research on quantum communication, parametric down-conversion (PDC) in χ(²) -nonlinear crystals plays a major role for the generation of photon pairs (see e.g. [1, 2, 3]). If the source is engineered in a way that gives control of spectral properties of the process , a rich temporal-spectral structure can be exploited for quantum communication . However, these so called temporal or time-frequency modes arising from the Schmidt-mode decomposition of the PDC state have to be controlled. The temporal and spectral structure of the photons can be accessed and manipulated via the quantum pulse gate (QPG, ). This engineered, nonlinear device employs a group-velocity matched sum-frequency generation process to operate on the temporal mode structure of PDC photons. Moreover, as the process converts telecom photons to the visible spectrum, detection is simplified. This process is especially efficient due to the high confinement in Titanium-indiffused waveguides in periodically poled Lithium Niobate where group-velocity matching between signal and pump guarantees a long interaction length of several centimeters. The constant temporal overlap is crucial to enable operation on the aforementioned temporal modes. Furthermore, the QPG offers the side effect of bandwidth compression that might actually prove to be quite useful in the context of interfacing flying qubits with atomic transition of quantum memories [7, 8]. Where m is an odd integer and describes the order of the quasi-phase matching . Thus the phase mismatch ?k can be compensated and an arbitrary wavelength combination for the sum-frequency generation, within the limits of poling technology of course, can be achieved. Moreover, temperature dependence of the refractive index offers an additional degree of freedom for fine tuning the phase matching . It has to be noted that in the experiment phase matching for more than one wavelength combination at the same time is possible. This is due to the fact that the waveguides support only a single mode for the signal wavelength of 1536 nm, but several spatial modes exist for the pump and idler wavelength, enabling quasi phase matching for several combinations of signal and pump wavelength. To be exact, this group velocity mismatch leads to a much longer pulse duration of the idler in comparison to the signal: Idler pulse duration is of the order of 20 ps, while the signal and pump durations are equally short at under 1 ps. As the spectral shape of the pulse is the Fourier transform of its temporal envelope, the bandwidth of the idler is in the range of tens of picometers, which makes a high resolution spectrometer indispensable for the characterization of the process. 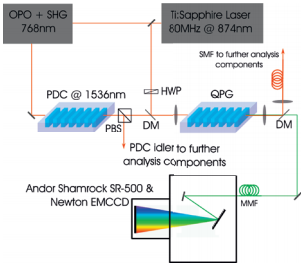 For the measurement of the phase matching we use the setup depicted in figure 3 which contains a pulsed Ti:Sapphire laser (Coherent Chameleon Ultra) operating around 874 nm and a tunable continuous wave (CW) fiber-laser (Tunics) emitting around 1550 nm. The fiber laser, which acts as signal, is swept while the emission wavelength of the pulsed laser acting as pump is kept constant. The small linewidth of the CW laser in comparison to its pulsed counterpart allows a very fine sampling of the phase matching . Half wave plates set the orthogonal polarizations required for the type-II process. Precise coupling through aspheric lenses to the QPG waveguide is controlled via a Elliot-Martock Waveguide Workstation offering a total of 10 degrees of freedom. The coupling is aligned in a way so that the pump is in the fundamental spatial mode when the output in imaged onto a CCD camera. The idler is then separated from unconverted light and residual pump by a dichroic mirror and coupled into a multimode fiber. 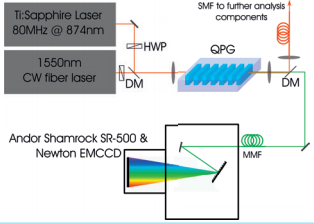 The fiber is connected to an Andor spectrometer system consisting of a Shamrock SR-500i-D1-SIL spectrograph and Newton DU970P-BVF EMCCD camera. 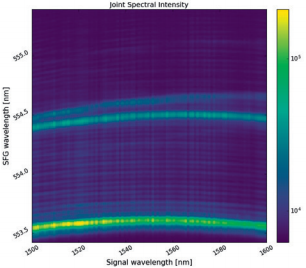 With automatizing laser tuning and acquisition of measured idler spectra a joint spectral intensity measurement of the SFG process as shown in figure 4 can be obtained. The plot reveals several features of the process. First, several spatial modes can be observed. Even though the majority of the pump power is in the fundamental mode associated with the bright trace at the bottom of the image, there is some residual power in other spatial modes leading to two more traces peaks in the middle of the image. Finally, the sinc-shape of the phase matching is visible for the brightest of the traces. It is noteworthy that the spectral width of the detected idler spectrum is only about 30 pm while the entire modal structure observed has a width of less than 2 nm. Observing details of that structure is only possible with the installed diffraction grating with 2400 lines/mm. At the available brightness level of the two lasers the electron multiplier of the Andor Newton camera can be turned off while still achieving acquisition time for each spectrum (the image shown consists of 100 spectra) in the range of 100 ms.
To observe the faint converted green photons from the SFG process, we take advantage of the exceptionally high quantum efficiency of the EMCCD camera. An obtained spectrum is depicted in figure 6 where one can still observe the peaks arising from different spatial modes. The acquisition time was in the range of a few seconds, however, the electron multiplier allows to lower the acquisition time as low as 300 ms which allows for real time view of the converted spectrum and is suitable even for alignment. The short acquisition time basically presents a real time measurement that allows further alignment of the waveguide coupling with the single photon signal. We characterized the phase matching function of a wave guided type-II sum-frequency generation process in Titanium-indiffused Lithium Niobate with a high resolution spectrometer and were able to observe the mode structure of this measured function. This enabled us to identify conditions for group velocity matching between signal and pump, which finally allowed efficient frequency conversion of single photons from a Potassium Titanyle Phosphase based Parametric Down conversion source observable in real time. Identifying the conditions which make the process group velocity matched enable a range of applications sensitive to temporal overlap such as operation on time-frequency modes [5, 6]. A. Martin, O. Alibart, M. P. De Micheli, D. B. Ostrowsky, and S. Tanzilli. A quantum relay chip based on telecommunication integrated optics technology. New Journal of Physics, 14(2):025002, 2012. A. Christ, C. Lupo, A. Eckstein K. Laiho, K. N. Cassemiro, and C. Silberhorn. Multimode ultrafast broadband information coding: State generation, characterization and loss evaluation. Number EA12. In CLEO Europe and EQEC 2011 Conference Digest, Optical Society of America, 2011. N. Sangouard, B. Sanguinetti, N. Curtz, R. Thew N. Gisin, and H. Zbinden. Faithful entanglement swapping based on sum-frequency generation. Phys.Rev. Lett., 106(12):120403, 2011. G. Harder, V. Ansari, B. Brecht, T. Dirmeier, C. Marquardt, and C. Silberhorn. An optimized photon pair source for quantum circuits. Opt. Express, 21(12):13975–13985, 2013. B. Brecht, Dileep V. Reddy, C. Silberhorn, and M. G. Raymer. Photontemporal modes: A complete framework for quantum information science. Phys. Rev. X, 5:041017, 2015. C. Clausen, I. Usmani, F. Bussires, N. Sangouard, M. Afzelius, H. de Riedmatten, and N. Gisin. Quantum storage of photonic entanglement in a crystal. Nature, 469:508–511, 2011. E. Saglamyurek, N. Sinclair, J. A. Slater J. Jin, D. Oblak, F. Bussires, M. George, R. Ricken, W. Sohler, and W. Tittel. Broadband waveguide quantum memory for entangled photons. Nature, 469:512–515, 2011.